Many thanks to Rorate Caeli for the link to the article from the Union of Catholic Asian News: Cardinal Zen Calls On Mainland Bishops To Act Wisely At Pivotal Moment. Cardinal Zen, the Bishop of Hong Kong, was writing in his diocesan Chinese language weekly newspaper, Kung Kao Po. Here is the original Chinese. Google will translate this after a fashion but if anyone who knows Chinese wants to do a proper English translation, I'm sure it would be warmly welcomed in the Catholic blogosphere. 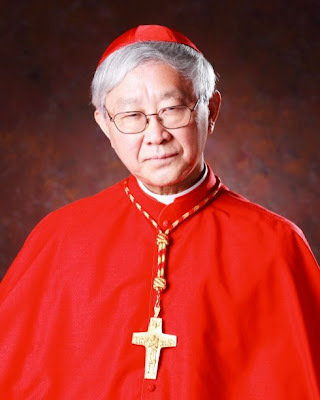 Cardinal Zen criticises the participation of some Chinese Bishops in the government sponsored celebrations of the 50th anniversary of the founding of the Chinese Catholic Patriotic Association (CCPA). He points out that forcing Catholics to do something against their conscience, such as the ordination of Bishops without the approval of the Holy See, is not a cause for celebration. Don’t be afraid. Bear the responsibilities that history has placed upon you! In this critical moment, your choice could revive the Church or it could let her languish for a long time. Pope Benedict has allowed Cardinal Zen to retire this year and focus on the affairs of the Chinese Church.